December 9, 2009 0 comments on "Peaceful Progress"
The fourth Peace Mala International Youth Awards were presented this year at a ceremony held in the United Nations Association Temple of Peace in Cardiff. Singer Bonnie Tyler distributed prizes to schools and youth groups from across the UK which are actively promoting peace and celebrating diversity. Guest speaker Helen Mary Jones, Deputy Leader of Plaid Cymru, praised the foundation of Peace Mala’s work. “Hate and prejudice are learnt but love, justice and tolerance are in the hearts of young people naturally,” she stated. First prize in the Junior category was allocated equally between two schools. 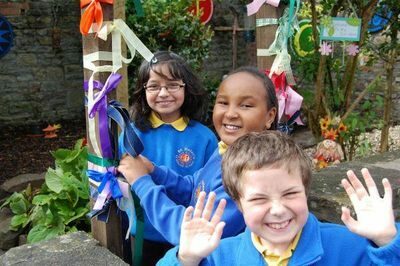 The accomplishments of Hafod Primary School in Swansea included creating a Global Faith Garden on the school’s roof, which the judges praised as “a multi-cultural haven”. Sharing the first place was St Helen’s Primary School, also in Swansea, who impressed with their “fully integrated principles of diversity and inclusiveness.” Positive Youth News was excited to learn of the children’s efforts to connect pupils by creating their own newspaper. Cllr Alan Lloyd, Lord Mayor of Swansea, was delighted with the many achievements of his city and county’s young people. “Swansea is becoming an increasingly multi-cultural society, so it is vital that our children grow up to become global citizens who have respect and tolerance for all faiths and customs,” he commented. In the Senior category, the top award went to the Sandfields & Aberavon Youth Inclusion Programme from Port Talbot. In conjunction with Cultural Fusion Wales and a community artist, young people produced a film, creatively expressing the Peace Mala ethics. Noting the enthusiasm and commitment behind the project, the judges found it an “ingenious and technically accomplished” result. “There was clear evidence of the huge positive effect that the Peace Mala project had on these young people, who are some of the most disadvantaged in the area,” they said. From 2010, an updated form of the Peace Mala Award will replace the current system. The new prize, which comes with a flag, was piloted this year. It will be given to schools that meet criteria for promoting peace in their daily running.